ecoTub Solutions can refresh the look of pool decks that have become cracked, dull, dirty, and worn. Our services improve and maintain the appearance and life of your deck. The Hawaiian sun can be very harsh and causes fading, drying, and cracking on pool decks and balconies. The red clay dust that coats many surfaces in Hawaii can be easily removed with this service. Our process includes: thorough cleaning pressure wash, repairing chips and cracks, resurfacing & sealing, expansion strip repairs, tile & grout cleaning, professional waterproof sealant application, and grout & tile repair. ecoTub Solutions offers professional pressure washing for home owners and commercial property owners. Trusting a skilled technician to power wash your surfaces means that you can feel at ease knowing that the job will be done correctly. Inexperienced power washing could lead to damaged surfaces and even injury. Our skilled workers know what psi pressure, nozzle tip, wand angle, cleaning mixture, and technique to use depending on the surface material and degree of soil present. We strictly follow all safety guidelines during the process. Cleaning: tile, shingles, metal, roofs, driveways, patios, walkways, balconies, pool decks, walls, floors, tennis courts, wood decks, stone, boat docks, gutters, spouts, windows, sidewalks, concrete, and more! ecoTub Solutions offers services to restore and protect your boat’s surfaces. The Sun, salt water, minerals, and dirt can dull the fiberglass finish on boat decks and hulls. 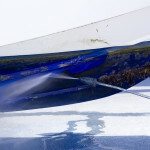 Often, boats become coated in a chalky film that is difficult to clean. Harsh cleaners could damage the gel coat layer, so it is best to have your investment cleaned by a professional.